The Merlin 1600W hair dryer. A powerful stylist. A superbly powerful motor kicks out up to 65 degrees of heat, drying wet curls in next to no time. Despite its superb hair drying capabilities, the Merlin 1600W produces just 65 decibels of noise when in use, making it ideal for morning hair routines. Suitable for all types of hair, the Merlin can switch between two motor speeds and three different heat settings. Designed to look tidy when not in use, the safety hanging loop keeps the Merlin up and away from wet tiles and hand basins. Neutral in colour with a polished trim around the nozzle, this hair dryer will look the part in the most upmarket hotel bathroom. 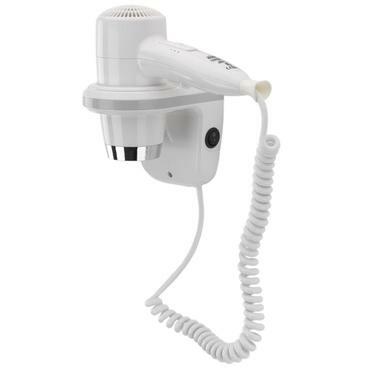 This hair dryer comes with our seal of quality approval and a two-year warranty, including free parts and labour should you need it repaired within the first year of purchase. 600W, Brushed DC 6,000 RPM.